VIDEO: New Dual Stream Recycling Procedure in Kingston Begins April 1st. The City of Kingston is switching from Single Stream to Dual Stream recycling come April 1st. Julie Noble, the City of Kingston’s Environmental Education and Sustainability Coordinator, hosted a recycling educational forum to explain the transition. Their materials are available both in English and Spanish. Paper and Cardboard ONLY will be placed curbside every other week in a new blue tote with a yellow lid. Glass, Plastic and Metal ONLY will be placed curbside every alternating week in your current blue tote. Trash pickup will continue as normal. In order to foster this transition, CASCADE, the City’s Tote Vendor, will be delivering a new additional blue recycling tote, with a yellow lid, for recycling of PAPER and CARDBOARD ONLY around the end of March or beginning of April 2019. Additionally, the City Public Works Department will be switching your existing black lid that is affixed onto your current blue recycling tote, with a new blue lid, and this tote will be used for recycling Glass, Plastic, and Metal ONLY. Each residence will be receiving, via the US Postal Service mail, a mailer which will outline the changes, and contain the new calendar and schedule. You will also receive a separate Recycling Flyer, which we encourage you to put up on your fridge for easy access. This will show all materials to be recycled, and in which locations. Additionally, to assist in the transition, the new lids will all have labels affixed to the lids which will show exactly which items to recycle in which bins. Please also find the same mailer information, below. 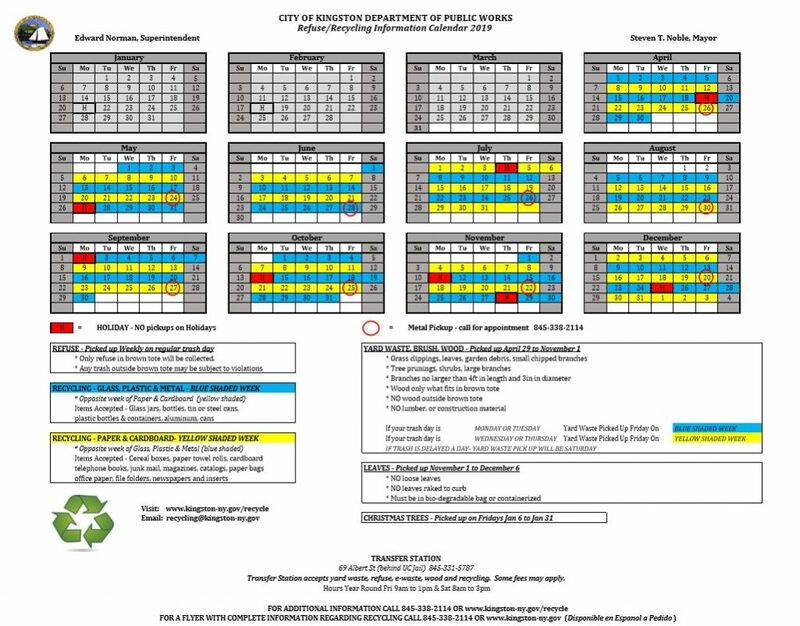 Also, please find the current, temporary calendar, which will be updated as soon as possible with the new calendar and information for Dual Stream Recycling. 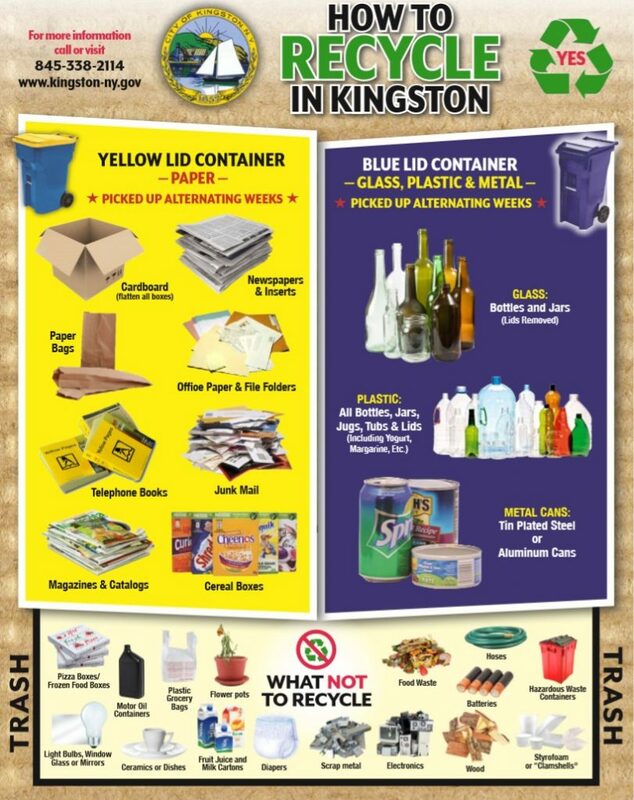 What: City of Kingston is transitioning from Single Stream (all in one bin) recycling to Dual Stream (separate paper from bottles, cans, jars) recycling. Who: All current City of Kingston customers who receive City curbside waste collection. Why: Due to a mandate from the Ulster County Resource Recovery Agency, our disposal site, based on tighter restrictions and changing demands of recycled materials. More Info or Questions: Please feel free to contact recycling@kingston-ny.gov or DPW Dispatch at 845-338-2114. Video by The Kingston News and Clark Richters on behalf of KingstonCitizens.org. On China, single stream and new containers. About the new recycling totes. About your existing tote and lids. More on recycling metal, glass and plastics. What is trash and how recycled materials are managed at UCRRA. Lid stamps and city handout. Demographics: Materials in English and Spanish. Transfer station option and fee schedule. VIDEO: Kingston Planning Board Sets Public Hearing on April 10th for Kingstonian Project. CoK’s Executive Branch Move to Streamline Commissions May Impair Historic Preservation Efforts.